Links to all of marklinofswedens videos on YouTube. It´s so easy with a good method! A well know and proven method of making nice looking forest for any scale model railroad layout by using micro fiber. Tutorial on how to model mountains from ground up to get that "expert look". Pine tree, Model a really nice looking Pine tree in 58 seconds! A well know and proven method of making Pine trees for any scale model railroad layout by using Spirea flowers. Quick and almost for free! A tutorial how to make a good looking, low cost street light in less than 5 minutes. How to disassemble the solenoid in the turnout to clean and polish the parts. The process is explained and important check points highlighted. Three layers of toilet paper with an rich amount of the mixture of water and wood glue becomes like thick pulp. The waves formed by a brush of suitable size. Check out the video before booking your trip to the layout of your dreams. The historic event when the Swiss Crocodile arrives to the Gavle Railroad museum in Sweden. Visit to one of the largest Model Railroad exhibitions in Sweden. 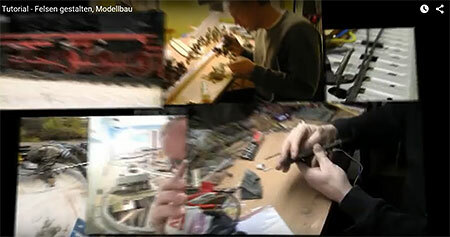 Constantly pushing the creative limits for the art filming a Model Railroad layout. A round tour on the layout using a small action camera. A videodocumentary from the largest permanent layout in Norway, Scandinavia November 2015. Himmelsboda station open for trafic. The first industry of the layoutens opens. First trainset, which completes a full tour around the layout after more than 26 months of designing and building. Testing the AC-version (well.. 3-rail version) with sound on M-rails. Not a clip for sensitive veiwers..
We are celebrating the 100st subscriber on YouTube! Yumguy2 gets the celebration gift!